Congratulations to all our winners at State Session. We had the largest number of entries in all the contests since I became your Lecturer. Believe me when I say the judges had a really hard time and in a couple of instances they changed their minds and then changed them back again. The biggest winner was our Grange. You all benefit from the entries. WHAT DOES THE GRANGE MEAN TO YOU?? The following is the 1st place winner in the essay contest. "At age 5, I joined the Juvenile Grange. It was the place to go and have a good time. I wasn't thinking about the ritual. Age 14, I joined the "big Grange" by now an important part of my life. Now 73, I don't know what I would be doing if I didn't have the Grange. It gives me a purpose in life. Being Lecturer keeps my mind active thinking of programs to put on. Helping with community service projects fills my days which otherwise would be lonely. No matter what your age, the Grange has a place for you." This First Place Essay was written by Joanne Cipriano of Beacon Valley Grange. Other winners in this contest were 2nd - Sue Gray, Ekonk Community Grange; and 3rd - Barbara Kulisch, Old Lyme Grange. An Honorable Mention was given to Helene Forrest, Hillstown Grange. 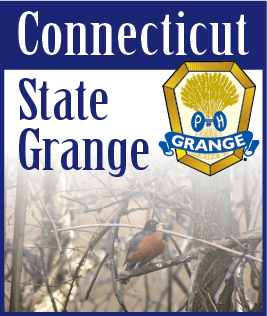 Winners in the Complete Program Contest were 1st - Russell Gray, Ekonk Community Grange; 2nd - Sue Pianka, North Stonington Grange; 3rd Maryanne Stone, Manchester Grange. Honorable Mentions were given to Barbara Kulisch, Old Lyme; Debbie Barnes, Stonington Grange; and, Joanne Cipriano, Beacon Valley Grange. Don't wait until the last minute. Now is the time to start thinking about next years contests. Your Lecturer will have a complete list by Nov. 1st. It was nice seeing so many of you at State Session. By the time you read this, we will probably be on our way to National, but when we get back I hope to see you around the State.